« Tuesday 26 April 2011 – Ice Camp! First Sampling Day. After yesterday’s first day on the ice, today was supposed to have been spent processing all the samples we collected. However, we forgot our special set of RNA-only pipettes and are still waiting for the set that Victoria sent by Fed-X. We have a back-up set available, but we are concerned that sometime in their past they may have been used with the preservative formalin, something we really don’t want to contaminate our precious RNA samples with. So we decided to postpone our RNA purifications in the hope that the new pipettes will be here tomorrow. The thing about shipping stuff up here by Fed-X is that Fed-X doesn’t actually ship to Barrow, they ship to Anchorage and then transfer them to a company called Northern Air Cargo (NAC). Although NAC does get it up here, like all things in Barrow, they are not necessarily punctual. We checked at their warehouse today if the pipettes had arrived but they hadn’t. We also tried to confirm that it was going to be ok to ship our dry liquid nitrogen containers home this time. Liquid Nitrogen Dry Shipper. For the record it is not a shipping hazard. It turns out that for some reason NAC lost their license to ship HAZMAT (Hazardous Materials); we don’t know why. 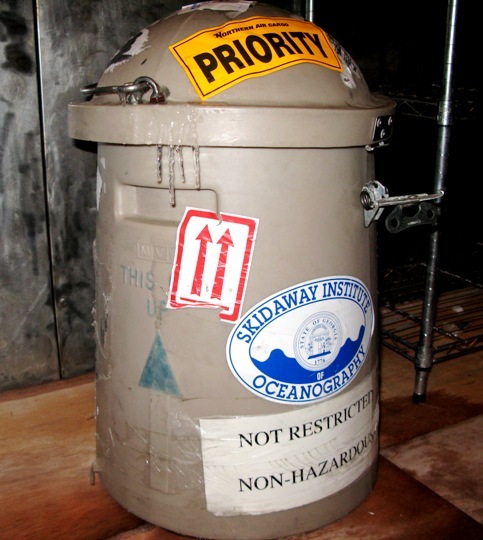 Dry liquid nitrogen containers are not considered hazardous since the liquid nitrogen is trapped in Styrofoam and therefore cannot spill, even if the container is tipped over or even breaks. However, they do look a little suspicious and we just wanted to confirm with NAC that they could be shipped. It would be a disaster if we couldn’t get our samples home. We need to keep our samples super cold otherwise they will be ruined. The temperature of liquid nitrogen is -196°C (-321°F) which definitely classifies it as “super cold”. However, the one person we needed to talk to wasn’t available so we’ll have to wait for that too. “Filtering Like the Wind”. Bronk group hard at work.. 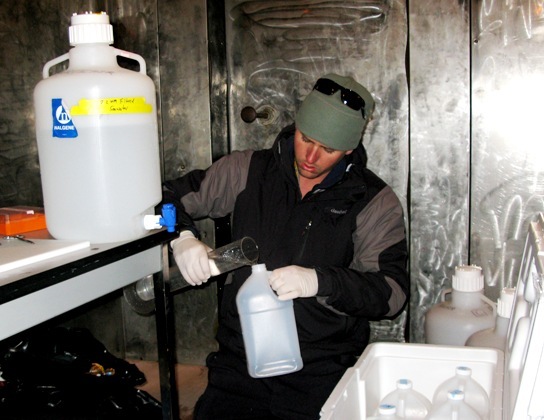 The basic design of their primary experiment is to incubate the water samples we retrieve from under the ice in the presence of various nutrients that have been “labeled” with a slightly heavier version of that nutrient (either nitrogen or carbon) so that that uptake or release of the nutrient can be measured on an instrument called a mass spectrometer. After a defined period of incubation, in this case 24 hours, the sample is passed through a filter and all the cells that incorporated the labeled compound of interest are captured on the filter and then can be analyzed. 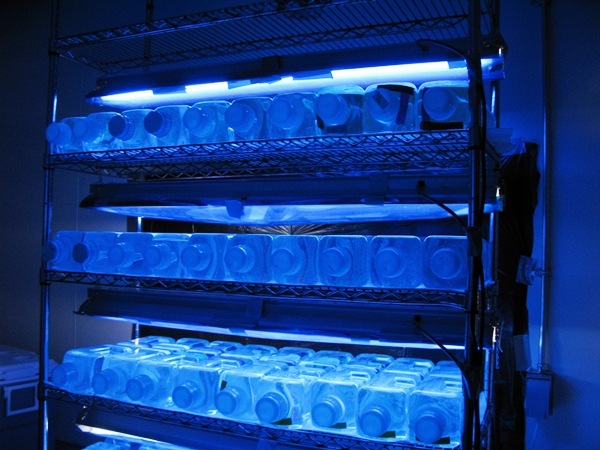 Incubating water samples at ambient temperature and light conditions (Bronk lab). 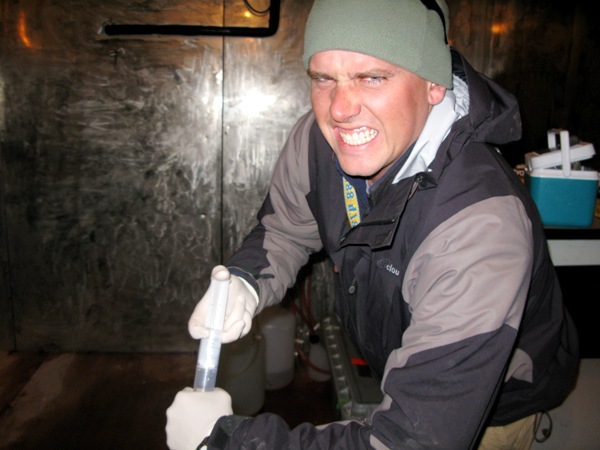 From these experiments we derive uptake and release rates of various nutrients by the microorganisms we are studying. Watching the Bronk group filter is like watching a well choreographed ballet. Hello blog readers, this is Zachary Tait. I am a masters student at Savannah State University and have been working on this Arctic project with Dr. Frischer at the Skidaway Institute of Oceanography since the beginning of 2010 when I moved to Savannah from North Carolina. In the last year, Dr. Frischer and I have been planning my masters project and this is the first trip that it has been implemented. The focus of my experiment is to measure the effects that the melting of permafrost will have on the microbial community in the coastal Arctic Ocean. As permafrost melts in the Arctic, the organic materials locked in the soil will flow into the Arctic Ocean, possibly changing the dynamics of nutrient uptake in the food web. I have set up 8 incubations to test what effect permafrost material has on bacterial growth and nutrient use, and am very excited to report that the experiment is going well. This last year of planning has paid off. We are taking a total of 40 samples per day, most of which have to be filtered through a syringe filter that is wearing our hands out much more than expected. We will have extra firm handshakes when we return! The experiment is going to run through Monday then the samples will be sent to the Virginia Institute of Marine Science, University of Georgia and back to our lab on Skidaway Island. 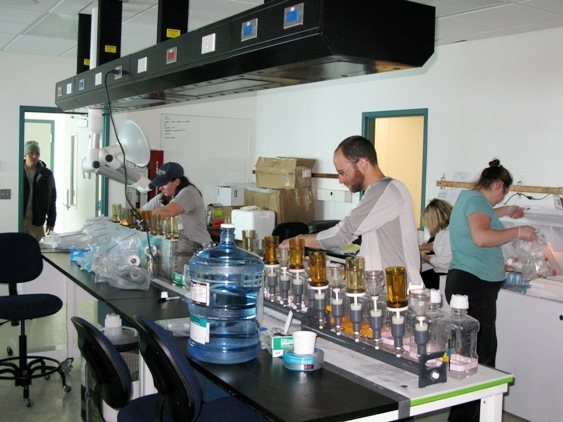 It is going to be a group effort getting all of the samples processed. Luckily, we have generous partners willing to help. This experiment will be repeated two more times in the summer then the winter of 2012. Hopefully, I will be able to post some results on the blog this summer. Extra extra, this just in on the radio, the first whale of the season has been landed. A 29 foot Bowhead! This entry was posted on May 2, 2011 at 5:30 pm and is filed under Climate Change, Environment, Global Warming, Marine Science, Oceanography, Research, Science, Skidaway Institute, Skidaway Institute of Oceanography. You can follow any responses to this entry through the RSS 2.0 feed. You can leave a response, or trackback from your own site.